We slept in this morning and after breakfast went to sit on the beach. Our hotel is not very busy so lots of seats at the pool. There are people coming around to ask if you want a henna tattoo. These are very big here and almost everyone has one. Tonight we are going into downtown Hurghada for supper. We ate at the El Forno Italian restaurant. The food here was very good and inexpensive. 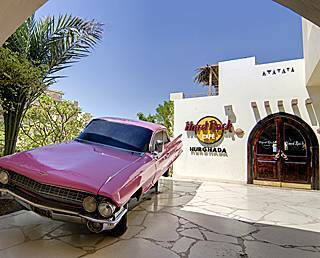 Being in downtown Hurghada is like any other resort. The streets are lined with shops and restaurants. Most people hang out at the coffee shops where you can get free Wi-Fi and a cold beer. It is great to just sit and watch all the people. Here, the vendors don’t really hassle you. Our guide Raymond took us to the marina where they have all the multimillion dollar yachts. All along the marina is restaurants and bars and is very popular. They had restaurants that had big bean bag chairs and the low couches. It gets very busy here later at night and they also have bands playing in the bars. On our way back to the main street we pass a wedding party. They have setup the reception in the middle of the street and have large canvas walls so you can’t see in. I guess it is cheaper than getting a hallJ. We did a little shopping then back to our hotel. The cabs here are very inexpensive. We paid 10.00 EGP for the ride back and forth from the hotel. That is around $2.00. Of course the price varies depending on if we have Raymond with us or not. We are up early and on the bus at 10:00am for our 7 hour drive back to Cairo. We head out across the desert and then follow the ocean up to Cairo. About 2 hours out of Cairo are many big resorts on the Red Sea that cater mostly to Egyptians. The driving in Egypt is very fast and there is an invisible lane in the middle that our driver is using a lot. We just keep our heads down and say a little prayer. We arrive back in Cairo but still have a 2 hour drive across Cairo to our hotel. We reach our hotel at 5:00pm and head to the pool for a quick swim and a cold beer. We have been drinking Stella beer that comes in a 1.5litre bottle. Very good. It is time to say goodbye to our tour guide Raymond. He has been one of the best guides that we have had and always went out of his way to make sure that everything was taken care of and that we had a good trip. I will be adding him to our Facebook page so if you are coming to Egypt and are looking for a guide in Cairo or anywhere in Egypt I would highly recommend him. He is listed on our page under Romio Nabil. It is also time to say goodbye to the other family on our tour. They are from South Africa and have been great to travel with. It was just our 2 families and we got to know them pretty well. After 12 days together, it is hardto say goodbye. Just in closing, I can tell you that this is the most interesting and best trip that we have taken. If you are at all interested in the history of Egypt, I can tell you that the temples that we visited where still in great shape and it’s not hard to imagine what it would have been like. Some of the color is still on the temples. If you are worried about the situation in Egypt, don’t be. We couldn’t have felt safer and our guide was always there to make sure all went smoothly. To say that Egypt is hurting from lack of tourism would be an understatement. There are places that we went that had fewer than 20 people. Please take the opportunity to travel back in time and see for yourself the magic of Egypt. people of Aswan and to watch the many feluccas on the river. We are up early today as we are docked in Kom Ombo and off the ship by 7:30am to see the temple. It is very close to the dock so we can walk to the temple. This temple is built in Egyptian style but built by the Romans. The temple is still in very good shape and you can still see the colors on some of the columns. Our guide Raymond is the best and knows a lot about Egypt and always answers all are questions. He is also very funny and it is great to have him as our guide. so great for Egypt. The people here are very friendly and we make our way back to the ship after our tour. Once we are all back on the boat, our continue our cruise passing through the Esna lock. Because we are travelling from Aswan to Luxor our boat is brought down to the lower lake. When we arrive, we have to wait our turn and that is when the fun starts. All of a sudden you will see small boats coming out to the ship and they start pulling things out of the boats to sell. They have many beautiful tablecloths and the long dresses that they wear in southern Egypt. Once we are stopped they start showing us there things for sale and the bartering begins. It was great fun to have them throw up the clothes and tablecloths for us to see and then we would take the bag and throw back the money to the vendors. This went on for about 1 hour and we did purchase a table cloth in the end but it was just more the fun of catching things and throwing them back. Many things were purchased this way. Tonight after supper, they are having a party so that everyone can wear the Egyptian clothes that they have purchased. Early to bed since we have an early start tomorrow. When we got up this morning we were already docked in Luxor. Because it is supposed to be very hot today, we head right to the Temple of Hatshepsut. This is a massive temple and we take a small train out to have a look. The temperature continues to climb and by 8:30am it is probably already 40 degrees. All of these temples are in the desert so it gets hot very fast. From there we go to the Valley of the Kings one of the highlights of our trip. We arrive and get on donkeys to take us into the site. This is a lot of fun as our donkeys try to pass each other. With our ticket, we are allowed entry into 3 tombs. These tombs are in great shape and the colors are still so vivid you would think that it was painted just yesterday. The Valley of the Kings is pretty empty so we are sometimes alone in the tombs and can spend as much time as we like. On the way in we pass the house of Howard Carter who discovered the tomb of King Tut. We need to take a little break so we head over to an Alabaster shop where they explain the different types of alabaster and how it is made. After a quick purchase of green alabaster, we head back outside. The temperature is probably around 45 degrees at our last stop in the Valley of the Queens. When we arrive here, we are the only tourists there and we have pretty well the run of the tombs until we run into 2 groups heading in as we are leaving. Egypt seems empty of tourists. We head to our hotel the Steigenberger Nile Palace. This is a 5 star hotel with a beautiful courtyard and we all bolt down to the pool. This hotel pool is right beside the Nile River and you can sit by the pool and watch the Nile all at the same time. We have 2 hours before we meet in the lobby and are off the Karnak temple. Karnak temple is actually a gigantic temple complex that covers a lot of area and is one of the best sites that we are going to see. 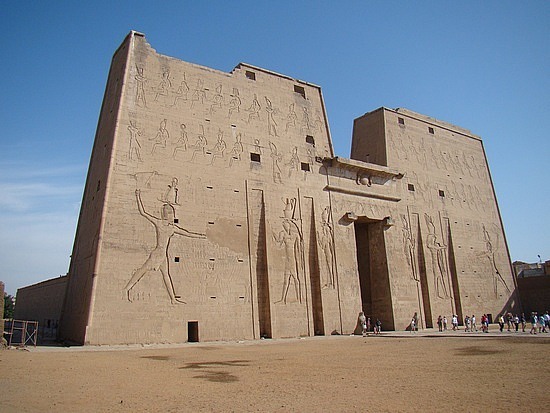 From the room with the massive columns to the largest obelisk in Egypt, this temple does not disappoint. It is hard to believe that this complex is over 3500 years old. From here we head over to the Luxor temple with its massive statues of Ramses the II. Now back to the hotel for some rest and some time out of the sun. I love the sun but even this is a little too much for me. We are heading over to the Red Sea tomorrow to spend some time relaxing before our flight home. Today, we are driving from Luxor to Hurghada which is a resort city on the Red Sea. It took us 4 hours and we arrived at the Safir Hotel around 1:30pm. 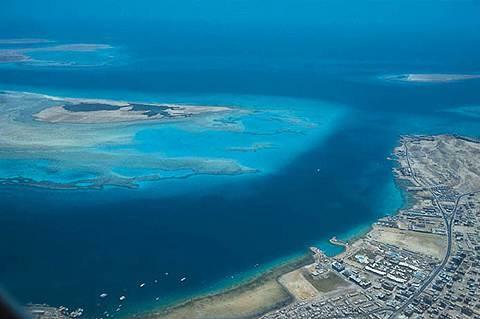 Hurghada is a resort town so the dress here is much more what we are used to. Here you will find people from Russian, Poland, Hungary and France. We have not seen any Americans or Canadians. I would think the problems in Cairo are keeping the tourists away. Our hotel is just out of the main part of the city and has its own beach. We went out for supper to a restaurant just down the street for Italian. This restaurant is just across the street from the sea and has a great view. The food and drinks are cheaper here in Hurghada then the rest of Cairo. We left this morning for a snorkelling tour on a large diving boat. The colors of the water here are a rich blue. We are going to snorkel in two different spots and then to an island for a swim. Both spots were great for snorkelling but there were probably 40 boats at both spots. This is low season so you can imagine what it would be like in high season. We even saw dolphins twice. 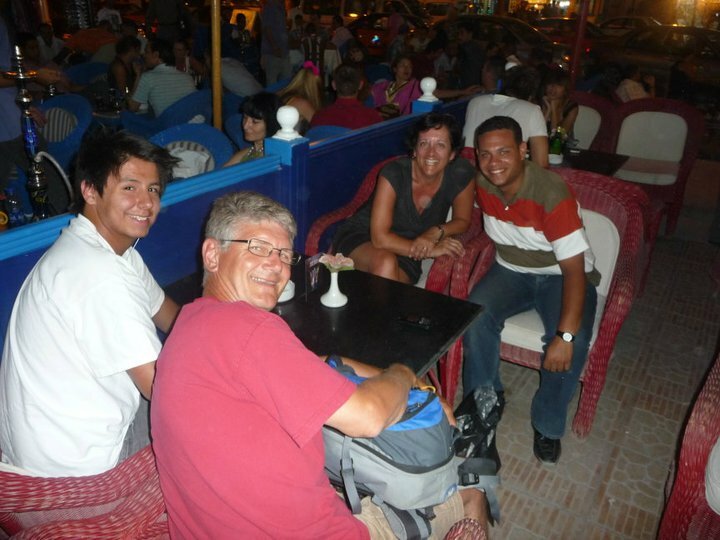 It was a great trip and very popular here in Hurghada. We got back to the hotel at 4:30pm and spent some time at the pool. The weather here is not as hot as the rest of Egypt but it would still be about 35 degrees. Tonight we promised our son a trip to the Hard Rock Café. The food was great as was the service. Tomorrow is our last day before we drive back to Cairo to catch our flight. It will be great to just do nothing for the day. After a very long flight, we finally arrived in Cairo. We were met at the airport by two employees of the Fairmont Hotel. It was really great to see our name on their board and have them help us to get our Visa and Egyptian Pounds. We settled into the hotel and after something to eat headed off to bed. This is a beautiful hotel definitely up to Fairmont standards. Each room has Wi-Fi, coffee maker and free water. The next morning we were met by the Kumuka rep and transferred to our tour starting point the Oasis Hotel in Giza. Tonight we , we went to the Caviar restaurant which is right across from the pyramids and has a great view while you eat. After supper, we went to the light and sound show at the pyramids. It was really something to see. Because it is low season there were probably only 100 people there so we were able to get great seats and get in and out quickly. Right before the show started, we heard our first call to prayers. It would be the first of many that we would hear while in Cairo. It reminds you that you are far from home. Today was my favourite day. We were going out to the pyramids, something that I have been thinking about since I read my first book on Egypt when I was 12 and they did not disappoint. There are three main pyramids and we stopped at them all. Our guide Raymond is very knowledgeable and takes the time to make sure that we get the full history. The largest pyramid, we were able to walk up to see the entrance and take some great pictures. We then headed to higher ground so that we could see all the pyramids and get some great pictures. From here, we took our first camel ride and it was a little scary at first but you soon get the hang of it and we had a great time. Our son loved the camel ride and the attention that the camel drivers paid to him to make sure that he had a great time and took off his hat so they could wrap the scarf around his head in pure Bedouin style. We then went to see the Sphinx and our guide teamed us up with a young man that took our pictures with the Sphinx that were very entertaining. In total, we spent three hours here and it is something that I will never forget. It was great to get back in the van as it was starting to get very hot. From here, we went to the first pyramid in Saqqara. The temperature was around 39 degrees with no wind so we were not here long. On the way home, we stopped at a papyrus store to see how paper is made and to see some papyrus pictures. Everything here is for sale J our last stop of the day was a visit to see Sheriff at his family’s perfume store. The store has been in his family since 1928 and he is the 3rd generation to run the business. You might be surprised to know that all perfumes come from a base of 10 essences and then are mixed from there to make the different perfumes that you know now. It was really fun trying all the different perfumes and left smelling like a lotus flower. We were still left with time to hit the pool grab some supper and off to bed. It is really tiring to be out in the sun all day. The 60 suntan lotion is working so no burns yet. We were up early this morning and then off for our city tour of Cairo. Our first stop was the Egyptian museum. There were so many artefacts to see that it was great having our own guide to take us to the best pieces. Then up to the second floor to see the King Tut exhibit. It was hard to believe that all these treasures came from just one tomb. The pieces were still in such great shape like it was only yesterday that they were made. The highlight of the trip was of course the burial mask of King Tut that sits along with the jewellery that he was buried with. It is great to be in low season as there were not that many people and at times you were alone to look at the mask. On our way out of the museum, we were stopped by a film crew who wanted to talk to visitors to Cairo. This was a live broadcast on three different Egyptian TV stations. They basically asked us questions about how are trip was going and if we were feeling safe in Cairo. The answer of course was we felt absolutely safe. Never did we ever feel like we were in any danger. It was just a quick interview and then on the Coptic Cairo with its very old churches and then to visit a Mosque and then to the Khan El Khalili bazaar. The bazaar is just a maze of streets and vendors selling every type of souvenir that you could dream of. While we were walking through the bazaar, I heard someone call my name so we stopped and a gentleman came up to us to say that he had seen us on TV and wanted to introduce us to everyone in his shop. The interpretation of that is come to my shop to buy something. So no surprise that we came out of there with a new souvenir. It was getting late so we hurried to the El Fishawey coffee shop for tea. While there we ran into another great salesman and left with a necklace, bracelet and earrings. Needless to say we had to get back to our hotel before we ran out of money. We stopped at the Canadian Hostel on Tahirsquare to have a quick shower and then off to the train station. We were taking the overnight train to Aswan in a sleeper car. I had heard many bad things about this train but none were true. The supper and breakfast were great and the compartments although small were more than adequate for a good sleep. We arrived in Aswan this morning to incredible heat. I think it was around 40 degrees. Since it was supposed to get hotter during the day, we went to the Temple of Philae which is on an island. This temple was one of the temples that had to be moved when they built the dam so that it would not be flooded. It was something to see how each set of different peoples put their mark on this temple. Then it was off to see the Aswan dam. The heat had become unbearable so we headed back to the hotel to sit in the pool to keep cool. At 4:00pm we went on a felucca cruise to enjoy the Nile River. 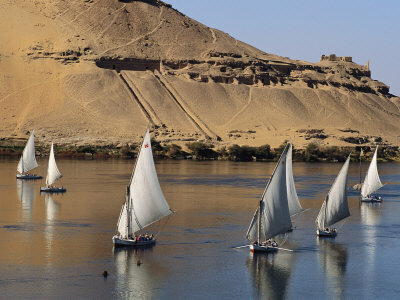 Along with all the feluccas were the cruise ships that ply the river from Aswan to Luxor. We are boarding our ship tomorrow. I am looking forward to getting on our ship.